Each year, the presentation of the John Williams Heat of Belmont Award is greatly anticipated. The award honors one third year or fourth year student who embodies Belmont’s values, including innovation, persistence, advocacy for change, community development and service. This year’s recipient, Hope Kramer, is a biochemistry and molecular biology major who will be attending medical school at the University of Iowa in the fall. Kramer has participated in study abroad trips to Glasgow as well as real-life learning opportunities with St. Jude Children’s Research Hospital and Siloam Family Health Center. Outside of her classwork, internships, academic research and student organization involvement, Kramer has also been a member of the Reformed University Fellowship. She chose Silmoam Family Health Center as the community partner recipient of the accompanying scholarship. In addition to student award winners, a number of awards were given to faculty members. The Christian Scholarship Award honors faculty scholarship that engages the Christian intellectual tradition and advances the scholarly conversation between Christian faith and learning. This year’s recipients were Dr. Elena Wong Espiritu, School of Occupational Therapy and Dr. Beverley Alleyne, College of Business. The Leadership in Christian Service Award honors faculty who provide leadership to a new initiative or an established Christian organization that serves those in need. This year’s recipients were Dr. Qingjun (Joan) Li, College of Liberal Arts and Social Sciences and Dr. Martha Minardi, Interdisciplinary & Global Studies. 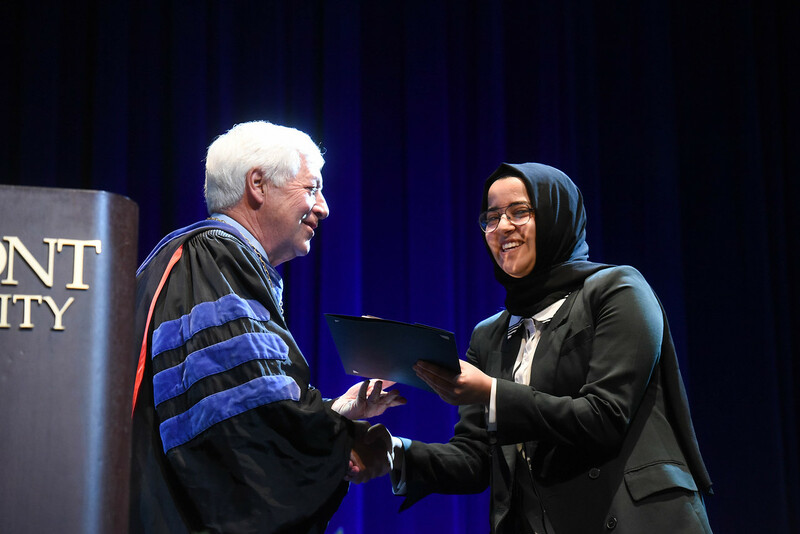 The Faculty Award for Scholarship recognizes a faculty member for outstanding intellectual and creative contributions of discovery, integration, application or teaching. This year’s recipient was Dr. Ronnie Littlejohn, College of Liberal Arts & Social Sciences.